Triple Chocolate Banana Bread – this EASY banana bread recipe makes the BEST banana bread! It’s my mom’s banana bread recipe and thanks to my partnership with Almond Breeze, it’s got TRIPLE the chocolate! As you all know, my daughter loves dancing. This year she is on a jazz production team at the local studio; it’s kind of a competition team light. The regular competition teams require 5-7 hours of dance per week, plus do all the competitions (about one a month January-July). We only have 2 hours of dance and 2 competitions, which I needed to ease myself into this whole “dance mom” life. Even though I am the furthest thing from a dance mom, I’m happy she found something she loves. She even tried out for – and made – the middle school dance team for next year. This TRIPLE Chocolate Banana Bread is a variation of my mom’s BEST banana bread recipe. That recipe has never done me wrong. I’ve made so many variations on it, including peanut butter banana bread, blueberry banana bread, and banana muffins with it. But I’ve never turned it chocolate before, and now that I have, I’m mad at myself because it’s OH SO GOOD. If I’m being 100% honest with you, the triple chocolate banana bread I gave Jordan was from loaf #2…because I ate loaf #1…by myself. 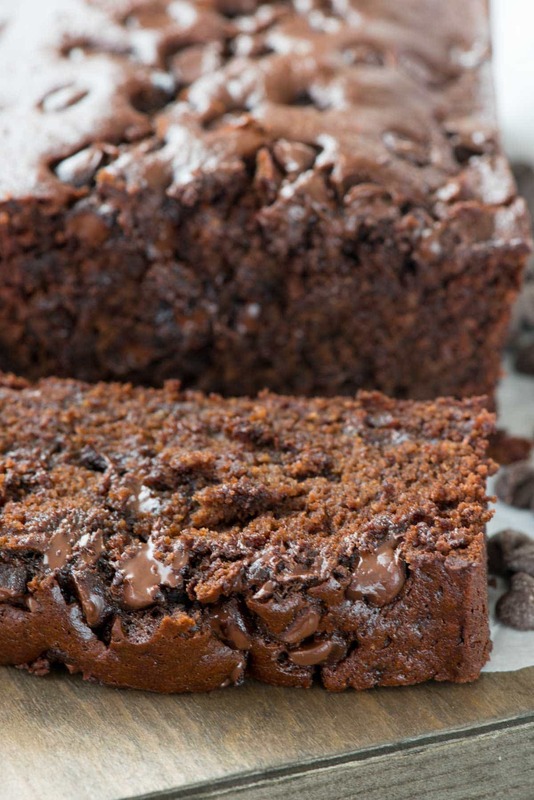 One of the best things about this triple chocolate banana bread recipe is how versatile it is. I’ve made it lower fat by substituting some applesauce for oil. I’ve made it lower sugar by reducing the amount to 3/4 cup. I’ve made it with whole wheat and white whole wheat flour. I’ve used milk, nonfat milk, buttermilk – it pretty much works with almost any substitution. When I made the bread this time, I added cocoa (obviously) and I also made it accidentally dairy-free, by using vegetable oil instead of butter, and almond milk instead of regular. Plus, the almond milk is CHOCOLATE, hence the TRIPLE chocolate in the title. 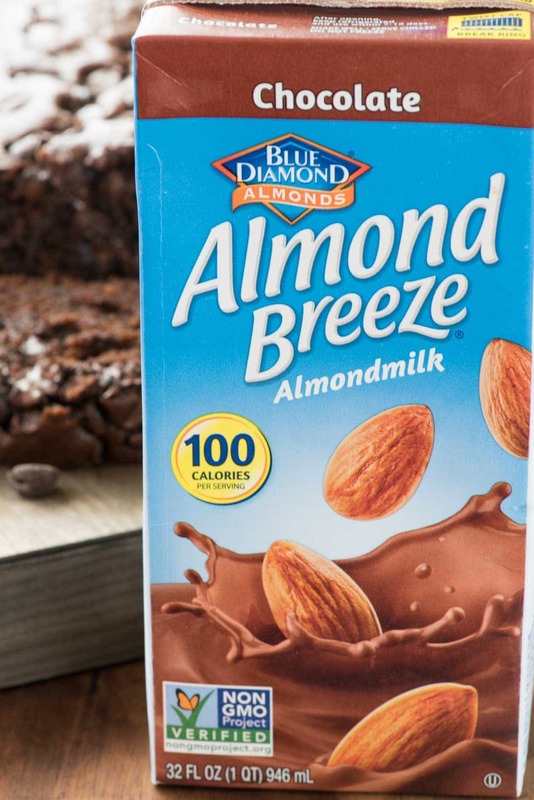 As you all know, I’ve worked with Almond Breeze for a long time now. I absolutely love their almondmilk, and I use it almost every single day in my cereal and smoothies. I also try and use it in baked goods whenever I make them for the family. 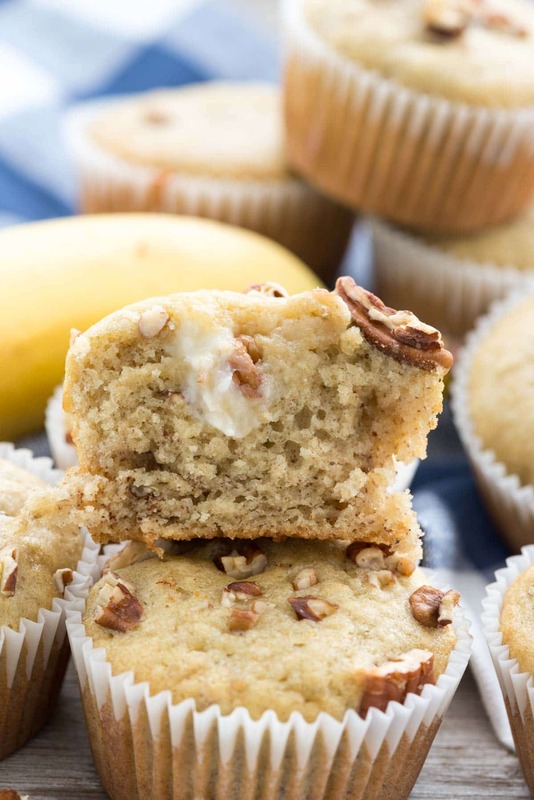 I often test recipes from this blog (like vanilla cupcakes or coffee cake) to see if the sub works and if I can add it as an option for people allergic to milk or dairy. Guess what? 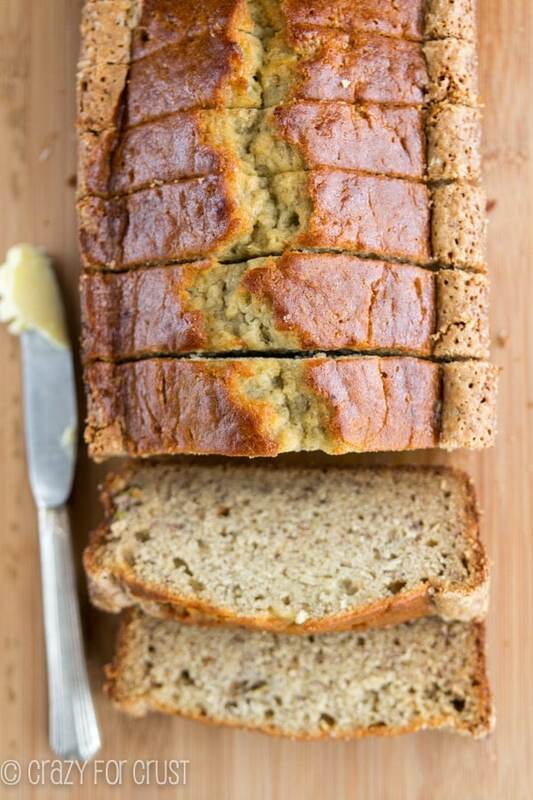 Almondmilk works in banana bread recipes, fabulously. You’ll notice that I use a blender to combine the wet ingredients. If you want, you can smash the banana with a fork, but there’s something about that blender that just makes the bread so good. I don’t know why, but it’s how mom did it, and mom knows best! 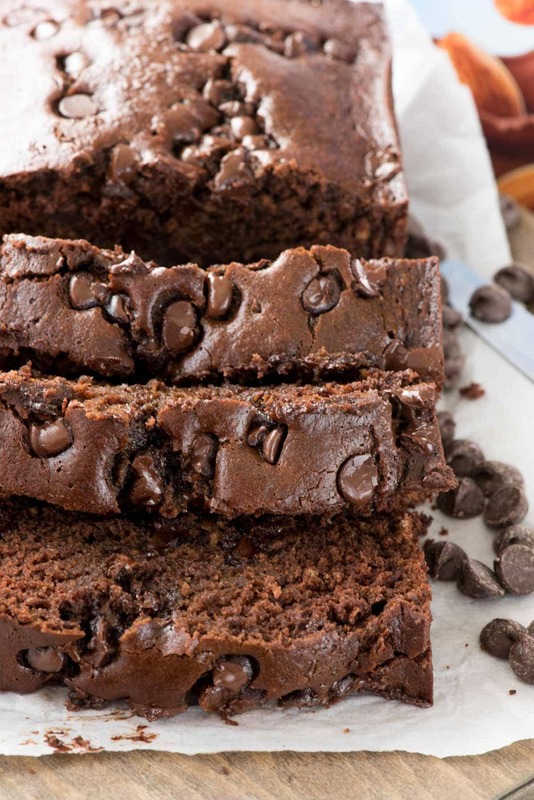 Enjoy a big slice of triple chocolate banana bread, and maybe even a glass of chocolate almondmilk along with it! 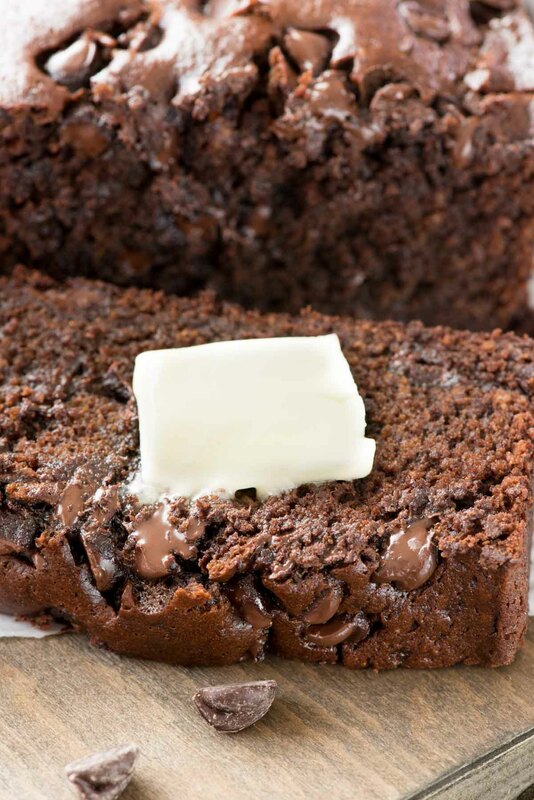 Triple Chocolate Banana Bread - this EASY banana bread is the BEST RECIPE! It's my mom's banana bread recipe with TRIPLE the chocolate! Preheat oven to 350°. Spray 9x5” loaf pan with nonstick cooking spray. Stir sugar, oil, and cocoa in a large bowl. Set aside. Add the bananas, eggs, almond milk, vinegar, and baking soda to a blender. Mix until liquefied. Pour half of the banana mixture into the sugar mixture with 1 cup of flour and mix until just combined. Repeat with the rest of the liquid and flour. Do not overmix! Pour into loaf pan. Sprinkle top with a sprinkling of chocolate chips. Bake approximately 40-50 minutes, or until a toothpick comes out almost clean from the center of the bread. Can i replace the chocolate almond milk with chocolate soy milk? Looking forward to trying this recipe but the measurement of 7 Tablespoons drives me nuts!! This is more accurate AND easier in my opinion. Salt in the ingredients, but not in the instructions. So I accidentally left it out. It’s in the oven now…! Hope it tastes ok! 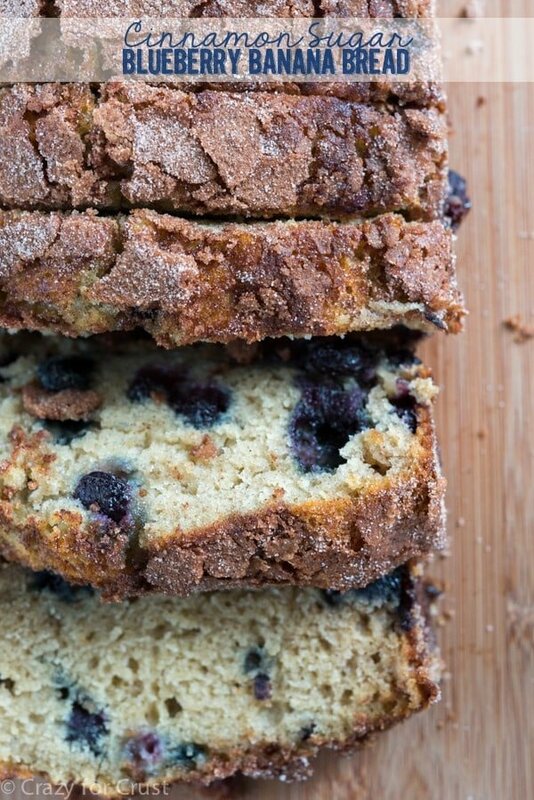 I love the looks of all of these banana breads – the chocolate and blueberry, but I hate bananas. Is there any way I could make these without bananas? Hi Dorothy! I bookmarked this delicious looking bread. I’m curious. How does the vinegar help the recipe? Thank you!